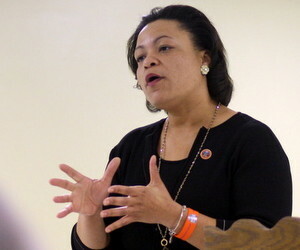 As the New Orleans City Council voted Thursday evening to increase the sales tax by 1 percent in the shops in the new Magnolia Marketplace, Central City residents voiced concern that the city’s highest sales taxes will be in one of its poorest neighborhoods, and Councilwoman LaToya Cantrell responded with her vision of a retail renaissance that makes Claiborne Avenue a citywide shopping destination. The Magnolia Marketplace planned at South Claiborne and Toledano will open in March 2015 with six national retailers and a fast-food restaurant — TJ Maxx, Ross, Michael’s, PetSmart, Shoe Carnival, Ulta cosmetics and Raising Cane’s. The $25 million project is being financed by a combination of direct investment and federal New Market Tax Credit, but developers have said they need $2.3 million more to close the gap on the major costs associated with replacing the old utility lines on the site. City officials have agreed to borrow the money for the project and to pay it back by raising the sales tax by an additional 1 percent on the shops at the site. When the debt is paid off, the tax will expire — in about 15 years, based on “conservative” estimates of revenue there, officials have said. Various stages of the project have already received approval in recent months, but Thursday evening was the final public hearing on the levying the tax itself, with the City Council sitting in its role as the Magnolia Economic Development District. The hearing came well after 5 p.m. — after the council had already met for about seven hours on the budget and other issues — and some of those who signed up to speak had left, but the eight speakers who did voice their opinions were mostly in favor of the project, but frustrated by the tax. Central City resident Liza Mazique agreed that the shops and jobs will benefit the neighborhood, and that attracting retail is a reasonable economic-development strategy. She was found it “hard to fathom,” however, why the financing strategy couldn’t have involved the new property-taxes from bringing the public land back into commerce, rather than a “predatory” and regressive sales-tax increase. “This is not a lot of money, $2.3 million,” Mazique said. “We probably could have done something a little more creative sooner. The City Council members generally had high praise for the project. Councilwoman Jackie Clarkson said that the people in the neighborhood will see their property values rise, and that meanwhile “we can’t keep shopping in other people’s parishes.” Councilwoman Stacy Head said the project will both increase access to retail for neighborhood residents who don’t have cars, and be cheaper than driving to Harahan — even with the tax — for those who do. The tax needs to be approved now so construction can begin, Cantrell said. City leaders have tried and failed for years to attract prominent retailers to Claiborne Avenue, and can’t afford to lose this opportunity to realize “a bigger vision for Claiborne Avenue,” she said, because others will follow as soon as the first project is built. Not only “poor people” will shop at Magnolia Marketplace, Cantrell said — it will draw shoppers from all over the city. But the city’s agreement with the developers calls for locals to receive customer-service training to prepare them to compete for the jobs, lifting the depressed economies around Central City as more retailers start to see it as a shopping destination. Thursday’s vote is the final City Council approval the project needs to move forward, said Aimee Quirk, the mayor’s econmic development advisor, after the meeting. Construction is expected to begin in January.